The 4,000-square-foot three-bedroom home features 14-foot ceilings and an abundance of windows for natural lighting. Elegance begins at the threshold, where stout wooden doors accented with glass and wrought iron open into a soaring entry. Cool tile floors provide counterpoint to the sparkling chandelier from an antique shop in New Orleans. To the right of the doorway is a hand-blown glass picture of the Madonna, the first of many Murano artworks the couple collected during their travels to Venice. The origins of Murano glass date back to the Roman Empire. Glassmaking originated in Venice, but in 1291 a law was passed that established Murano as the premier glassmaking source of Italy. Today the city is still recognized as the world’s center of art glass. For Kristine, lighting is an important component of interior design, and the chandelier is her mainstay. “In my opinion, every home should have them,” she says. Her sunroom is no exception. The chandelier in this room is from Venice and is a perfect complement to the room’s casual décor. 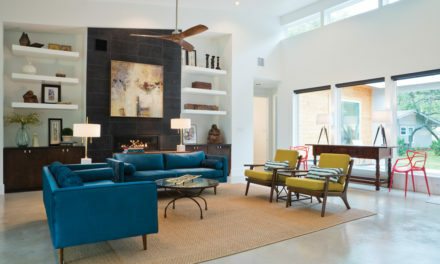 The aqua green sofa and chairs are grouped around a large glass and iron coffee table. The curio cabinet holds glassware collected from Kristine and Jerry’s travels; much of it is from Italy. 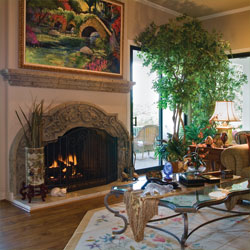 Across the room, soaring built-ins flank the large stone fireplace. The hand-blown glass vases displayed in the sunroom are by Peter Raos of New Zealand. Raos is a world renowned glassblower whose vases and paperweights resemble impressionist garden paintings. The back wall of the sunroom is of glass, with French doors leading onto the expansive patio. The patio overlooks a landscape of flowers, turf, pavers and a large round fountain that burbles amid birdsong. The Funks enjoy entertaining here when the weather is fine. 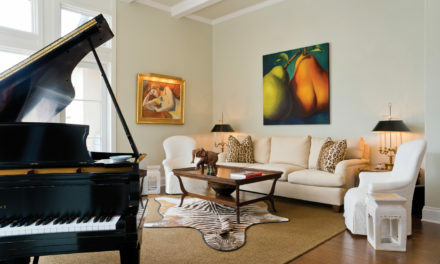 When the weather is inclement, gatherings move to the living room, where another chandelier presides over a room of white shutters, sofa, chairs and accents. The tall shuttered windows are topped by small round windows, rather like the dot over a lower-case “i.” Kristine says, “Those windows catch your attention when you drive down the street. I’ve never seen anything like them.” The fireplace is a twin of the one in the sunroom; an ornate mirror hangs above the mantel, reflecting the room’s natural light. Paintings of Venice hang on each side, reminders of long walks the couple took on the canals. Cut glassware is displayed on a silver tray on the large coffee table. Along one wall, a collection of brass candlesticks clusters on a sofa table. Through the door on the far side of the dining room is the bar, which connects to the kitchen. Kristine points out the unusual sconce on the wall. It resembles a bunch of grapes and is another piece of art glass from Murano. The spacious kitchen is a cook’s paradise, with a place for everything. Storage is abundant. “In fact,” Kristine says, “we have so much storage that when we moved in, I used Post-It notes on the drawers and cabinets so I could remember where I put everything.” One end of the room serves as a breakfast area, with an antique three-pedestal table that seats six. The dainty chandelier over the table is another Murano art piece. A vintage Regulator clock faces the table, marking time for dinner. On the opposite wall is a convenient kitchen desk, built into a long counter and cabinet arrangement. Kristine plans her days here. The spacious island commands the center of the kitchen; each side contains shelves or drawers. All the countertops are granite. The tile backsplash along the back wall is Wedgwood blue, with tiny squares of the granite countertop worked into the design. With the exception of the Sub-Zero refrigerator, all the appliances are Jenn-Air. Beyond the kitchen is a large storage closet with shelves holding all kinds of Christmas wrap and decorations. The laundry room across the way can easily handle the demands of a busy family. And the garage is a handyman’s dream —not only is there plenty of space for two cars, but there is also a bay with a workbench and sink. Jerry has a beautiful study, located to the left of the entry hall. The room has large windows that provide natural light and no glare on his computer monitor. A wall of built-in shelves displays part of his extensive collection of Western bronzes. The large wooden desk and comfortable chairs make this a pleasant room for business or pleasure. The two guest rooms have their own baths, and each takes advantage of the high ceilings for its décor. The four-poster bed in the pink room would overwhelm a space with a lower ceiling, but it’s a perfect fit here. At the foot of the bed is a handmade doll house, complete with furniture and hand-woven rugs, belonging to Kristine’s daughter. “I’m waiting for the next generation to come play with it,” Kristine chuckles. The master suite is divided into sections. The master bath features a large Jacuzzi tub beneath a garden window, a tiled frameless shower alongside. His-and-her vanities are separated by the doorway. Kristine and Jerry have their own roomy walk-in closets at opposite ends of the bath. A short hall connects the bath to the master bedroom. The space is used to display Kristine’s colorful collection of perfume bottles and paperweights. “Looking at the colorful glass, in all its shapes and forms, always makes me happy,” she says. 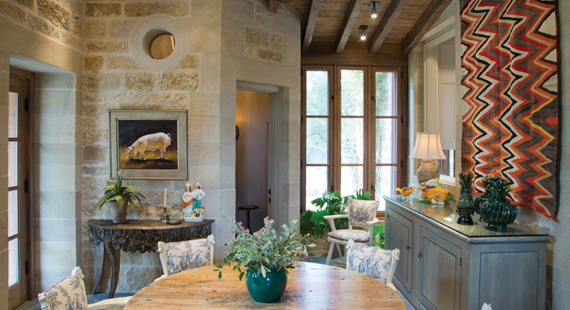 The master bedroom opens onto the back porch through tall French doors. 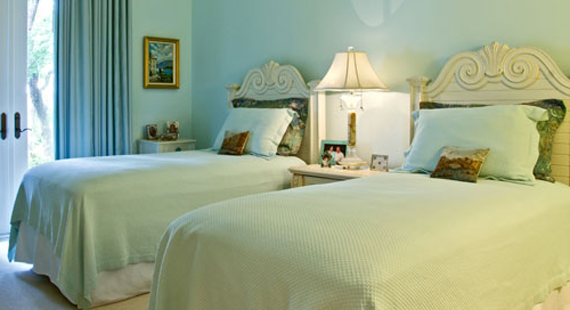 The king-size verdigris metal bed is dressed in off-white bedclothes with piles of pillows and a soft spread. It faces a set of built-in cabinets that hold curios, a large flat-screen television and a beautiful open umbrella from Myanmar (Burma). Beside the cabinet is a portrait of Kristine’s daughter painted by Billy Price Carroll, a portraitist of international acclaim.